I hope that you are enjoying your summer! Yesterday my grandma and grandpa took me, my kids and two of my cousins to see Kung Fu Panda 2. It was fun. I'm so blessed that my kids can still do things with their GREAT grandparents. How rare that is. Yesterday morning I was emptying the trash cans around the house. I got to the one in my powder room and thought, "wow this thing is gross". I bought a metal trash can a couple of years ago and it now has rust spots on it. I now put garbage bags in it, but it looks kind of ugly. Honestly, it looks really ugly. 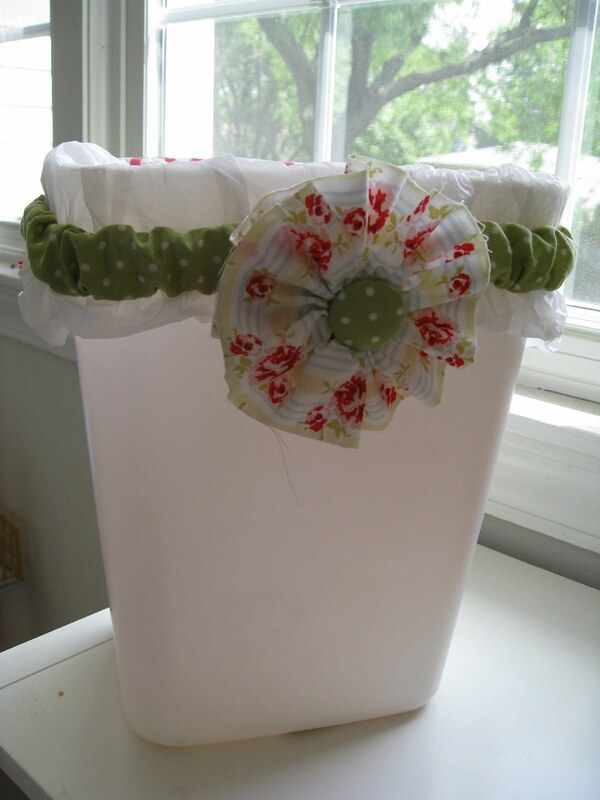 I thought of a way to make it look a titch cuter ;) A garbage can bag holder upper for your little garbage cans. Now, I know that usually, little garbage cans don't need help in this area. The sides of the bag hang so low outside there is no danger of the bag falling in and you needing to reach in through snotty kleenex, q-tips and heavens know what else the kids may toss in. This is more cosmetic. Do I have better things to do than dress up my garbage cans? Am I concerned that when my kids grow up they will bring up the summer mom spent making crazy crafts? Eh. Not really. A tutorial to beautify your little cans. Garbage cans, that is. Measure around the top of your garbage can and subtract an inch or two. That's how much elastic you'll need. I used 3/4 inch wide. 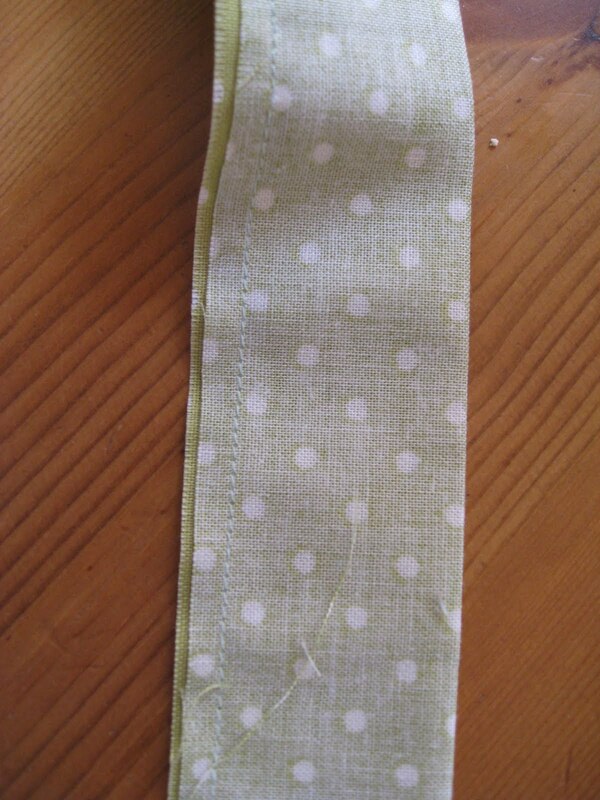 3 inches wide by double the length of the elastic. In my case 45 inches or so. Step one... Take your fabric cut 3 inches by whatever length is double your elastic and fold it in half so that the right sides are together. Iron it. Step two... Sew the long raw edge with 1/4" seam allowance. Be sure to double stitch each end a couple of times. Step three (or the annoying step as I like to call it)... Turn the fabric right side out. Using the wrong end of a knitting needle to help feed the fabric through helps me. It will take 5 minutes at least. Step four... Pin the end of the elastic. Feed it through the fabric "tube" making sure you hold one end so that it doesn't get lost in the middle. Step five... Sew the end without the pin to the fabric with a 1/2 inch (or so) of elastic sticking out. 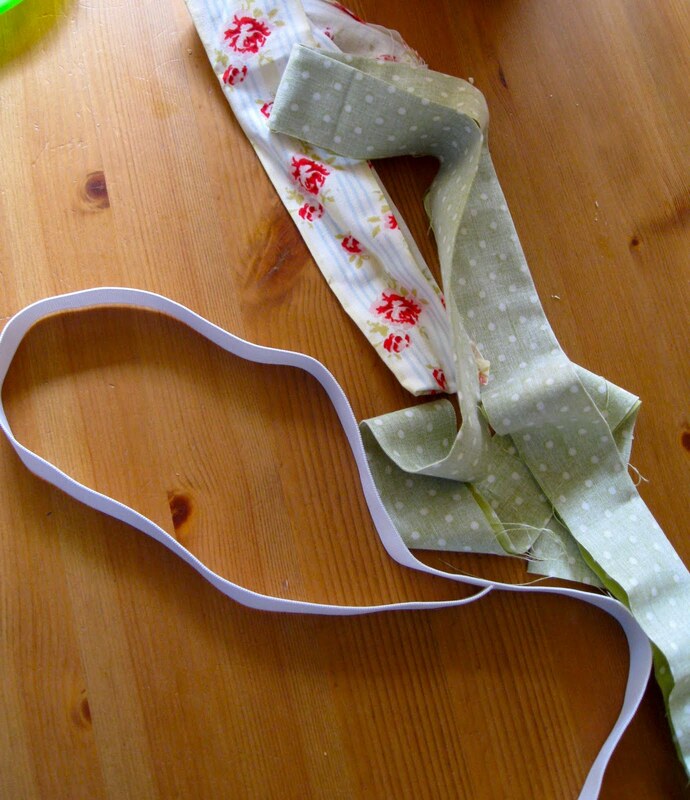 Sew the the other side of the elastic to the end you just finished. Triple stitch. Step six... Do your best to fold the end of the fabric tube under and sew it over the raw elastic. Step seven... You are DONE. Strap it to your can. 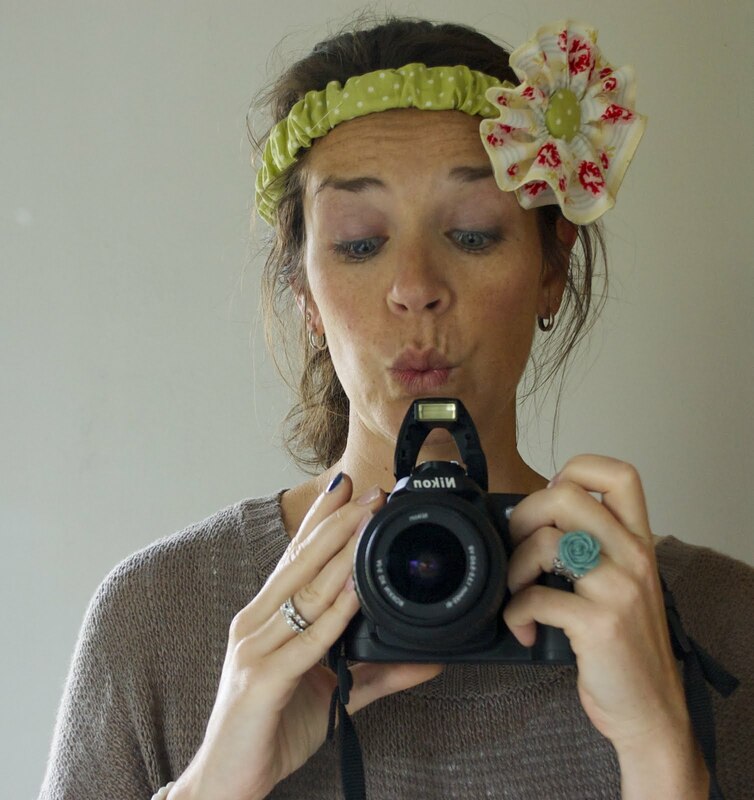 I put a fabric flower on mine to make it even more fabulous. Here's the garbage I made it for. As you can see it needed a little help. The best part is you can wear it on your head when it's not on the garbage can. Just kidding. In the meantime. Have fun dressing up your trash cans. You have the best ideas!!! Thank you for this tutorial!! argh...hate step3! :) I may be getting a Nikon D80 for $200 but have to wait until October! The wait is KILLING me! I like how you get around to sewing and other things I can't do before cleaning your one blue fingernail you still have! Funny! Are you trying to start a new fashion trend? What a good idea! And very cute too! Only YOU could make a trash can cute!!! Love it! I am loving this! Super cute. 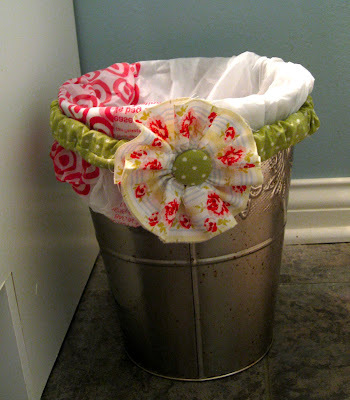 Everybody needs to learn how to make their trash can cuter :) Would love if you would link up with us on Sunday for our first ever link up party! Thanks for sharing. Abby, Only YOU would notice that. Ha. Tina! Only YOU!!!! Only YOU!!! Step #3 Improvement Idea: Pin a large safety pin to one end. Turn it around an push it through until the band is turned right side out! Very cute. Can you tell us how to make the flower? i love this, so fab! love your blog too. Hi, I'll be linking to your tutorial tomorrow on my blog, My daughters garbage needed something to keep the bag from falling in. Okay...I want three garbage can holders (too cute). I can't sew to save my life, so how much? Anyone sell these on Etsy or somewhere? Brilliant!! Why didn't I think of that! What a great idea.Very cute.I need one badly. Super CUTE! I have a little girl and I was thinking...........hmmmm I could use some of those "gaudy" bows (instead of the flower on the side) someone gave her that she will NEVER wear since they are as big as her head lol! anyway you can post instructions on how to sew the flower, that is super cute! Great idea too!